F.A.A. Lifts Ban On Flights To/From Turkey Effective July 18th 2016 – Turkish Airlines Flight Resume on the 19th July! 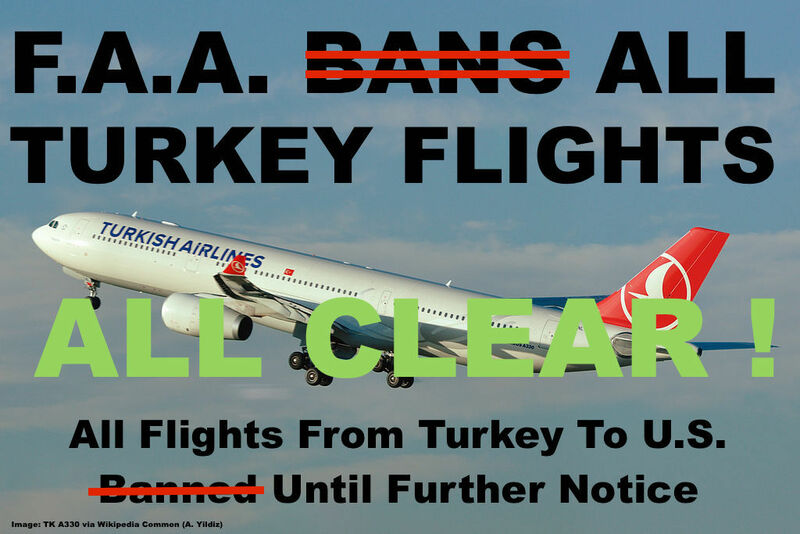 Just two days after placing a ban on all flights coming from Turkey the Federal Aviation Administration (FAA) has lifted it again, giving the ‘all clear’ to passengers and airlines. Turkish Airlines, the only airline operating direct flights between Turkey and the U.S. announced that they will start operating their U.S. bound flights again from 19th July 2016. Following the failed military coup in Turkey and seeing people breaching secure areas at Istanbul Airport the FAA placed a ban on all flights to and from Turkey (LoyaltyLobby wrote about it here). This left a lot of people uneasy and also in a bind because Turkish Airlines flights were not allowed to operate. Passengers had to be re-booked onto alternate connections on other carriers. A friend of mine was booked on Milan-Istanbul-Boston and got re-booked on SWISS via Zurich and even scored an operational upgrade to Business Class as Turkish Airlines Star Alliance Gold . Lucky! So passengers on Turkish Airlines can breathe again for the time being, if your flight to/from the U.S. is scheduled to be on or after the 19th of July you are taken care of depending on the original departure time. In any way I’d check with Turkish Airlines for delays. Those were some bumpy 48 hours. I still believe the ban was due to Istanbul Airport requiring a security sweet of the whole airport to ‘vet’ it as being safe and sterile again after people were seen on videos just walking through the abandoned checkpoints and on the tarmac. Let’s hope operations are full up and running again as soon as possible. If you are still waiting to get a ticketing issue resolved either contact your travel agent, a local Turkish Airlines Sales Office or the Central Reservations (via hotline).